Several years ago, my cousin invited me over to her new home to give me a full tour of the place. She’s always had an eye for decorating. As she showed me around, I could hear in her voice how incredibly proud she was about how each of the rooms had turned out. One of the last areas she led me to was what she called “the study,” where large dark mahogany bookcases brimming mostly with antique books stood the entire length of the back wall. A wooden ladder on wheels, used to reach the high top shelves, rested vertically across one bookcase. Two burgundy leather reading chairs sat comfortably below on the cherry hardwood floor in front of a well-placed ornate Oriental rug. All that was missing was a roaring fire and my smoking jacket. I did. I really did. In fact, I loved it. And that wasn’t just my Liberal Arts degree brainwashing kicking in, either. The room felt warm and welcoming because of those great pillars of old books stretching out like loving hands, urging me to sit down and pull out a pipe or something. That room held a magic you only see in the movies, where the master of the mansion struts in and lifts one of the tomes to reveal a secret passageway. Only I didn’t want to find another hideaway; I was perfectly content staying right there. I would have loved to have cozied up in one of the chairs and spent the whole afternoon dissecting themes of Catechistic cannibalism and flatulence in Ulysses with her as I swirled a glass of brandy in my hand, but when I jokingly pointed to her copy staring up at us, she admitted to having never opened the cover. Its job, she said, was to bridge the big gap there on the bottom shelf. The conversation abruptly ended, and the tour continued into the recreation room with the pool table. There are all kinds of reasons why people collect things. To some, particularly ardent book lovers, it may seem strange why a person who doesn’t read much would have such a large library in her house. What purpose would it serve? To others, say Architectural Digest subscribers like my cousin, that oddness may never cross their minds because the space is so meticulously presented and put together. To them, the books’ function would be quite clear. The word “collector” has gotten a bad rap over the years. To some classic video game purists and preservationists, it’s become synonymous with “hoarder,” with someone who acquires things just for the sake of possessing them. But that’s not entirely true. As in my story, there’s always a purpose to the pursuit, even if an item’s ultimately only meant for display. The real concern, in my mind, is when communication breaks down and one-of-a-kind artifacts are left forgotten on untouched shelves. That’s when frustration sets in, and history can become lost. That’s not always the case. In my online travels, some of the most passionate, enthusiastic, and helpful people I’ve met have been dedicated collectors. These folks treat their collections with care and are as hands-on yet reverent about their pieces as a curator in a museum. They take great pride in documenting their objects, and are eager to share their knowledge with anyone curious enough to ask. The excitement from them is palatable and encouraging. In this oftentimes tough world, anything that gets you riled up, even if it’s “just” talking about old collectibles, can be a healthy outlet from going completely mad. However, as you’re about to see, there’s a fine line between a little happiness and a lot of obsession. Personally, I don’t collect games anymore. I can actually pinpoint the precise moment when I stopped. I won’t mention the chain store by name, but there was one that I used to watch early in the morning when they first updated their site to add newly traded-in classic games. This company always had at least two active coupon codes that you could use together, along with free shipping, so sometimes I could pull in some great deals. I woke up one weekday morning, and their online inventory blinked and then began listing pages and pages of Nintendo Entertainment System games all priced at less than a dollar each. 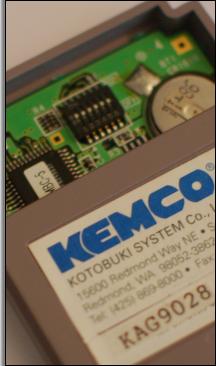 Without even thinking, I started adding them one at a time to my cart, checking out immediately with coupons and free shipping applied, then heading back to do it all again–pausing for only half a second to read the game’s title to make sure I didn’t already have it on my list of owned cartridges. I continued this until other customers caught on to the savings and everything eventually went out of stock. I was so thrilled with how many I had managed to snag! I had scored Nintendo games, shipped to me, for around .59 each. Only in America! A week or so later, I came home to find a grayish molehill of Media Mail packages piled up on my doorstep. I used to love “delivery day,” but this environmentally unfriendly mess changed all of that. I took them inside and peeled away the seal on one. John Elway’s Quarterback. Then another. Sesame Street Countdown. And on and on like Christmas day in the third circle of hell. After a dozen more of the most putrid titles imaginable lay stacked before me, I tore open the last mailer. Muppet Adventure: Chaos at the Carnival. From that day forward, I slept in. I owe that all to the Muppets and Hi Tech Expressions. I started saving up for prototypes instead–games that felt more meaningful, more rewarding to acquire. Life seems so much more fulfilling now that I buy and trade Hi Tech Expressions prototypes. But there are some things I do still collect that I don’t have much control over; namely, anything involving mutant reptiles. I blame my reptilian brain. In early August 2013, I happened upon a Reddit post that made me do a double-take (link). The submitter claimed that his parents’ friends had bought a house fully furnished with gloriously geeky collectibles as far as the eye could see. News outlets like CNET took notice and began reporting on the surprising find (link). 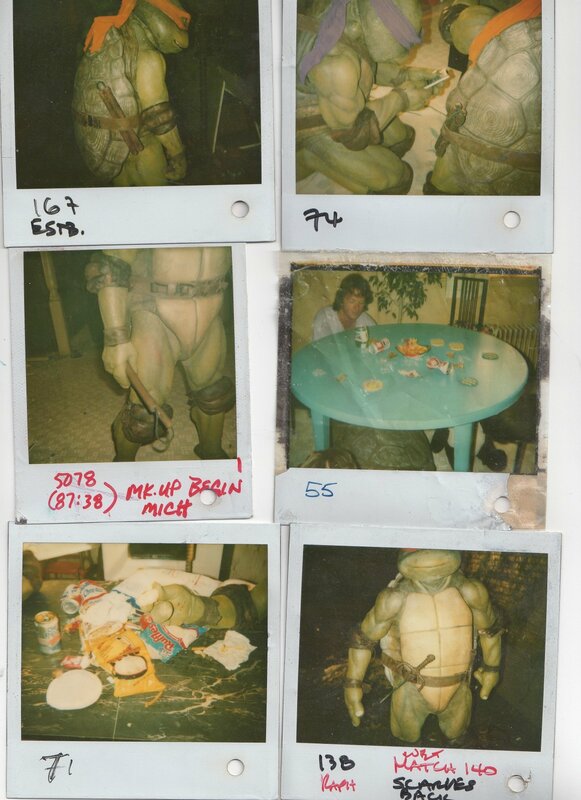 While looking at the photographs, I zeroed in on one thing in particular: a full set of what appeared to be weapons from the original Teenage Mutant Ninja Turtle movies. 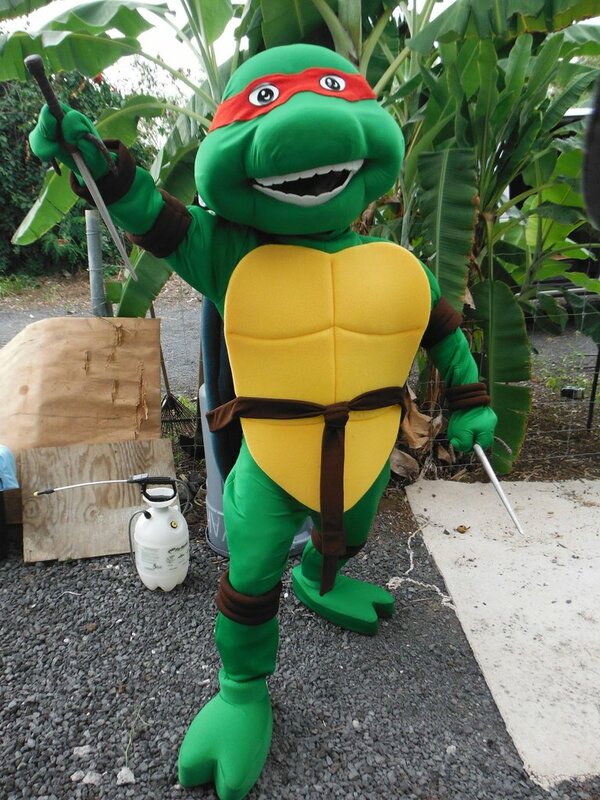 I’ve been researching and trying to save Turtle props for years now, assisting others in the process like The Children’s Museum of Indianapolis, which procured a restored Raphael suit from Teenage Mutant Ninja Turtles II: The Secret of the Ooze in 2011. 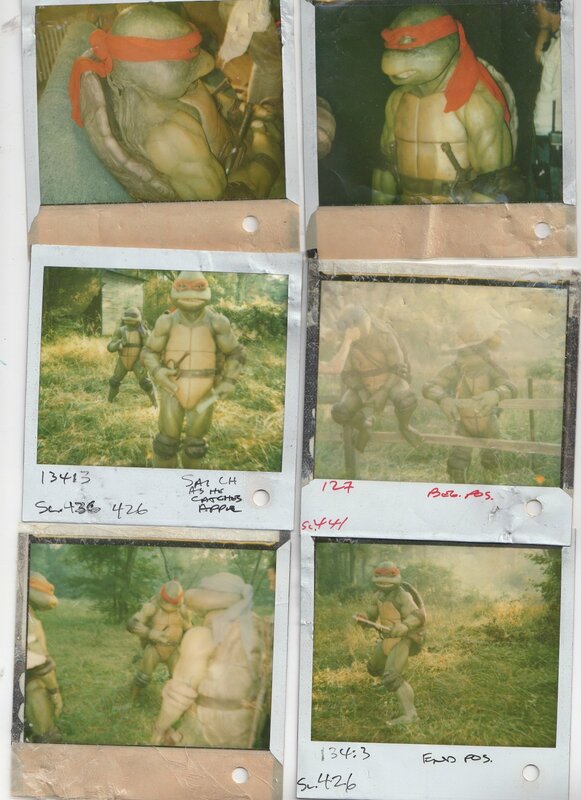 It is important to mention that Raph was preserved because many of the Turtle outfits and movie puppets have been destroyed over the years. The main reason for that is because they were made of foam latex, a temporary material, which, if not cared for properly, will eventually dry up and turn to dust. Crewmembers have told me that foam latex mementos they had taken after filming quite literally vanished while in storage years later, becoming victims to sunlight, high temperatures, and oxygen. The full-size Splinter from Teenage Mutant Ninja Turtles III, for instance, deteriorated to the point that the poor sensei’s rat corpse became so mangled and beyond repair that his furry remains were shoveled into a trash bag and thrown out in a most undignified burial. Another reason for the destruction of these props is because they find themselves in the hands of individuals who cannot afford to do the proper maintenance and restoration that is required. 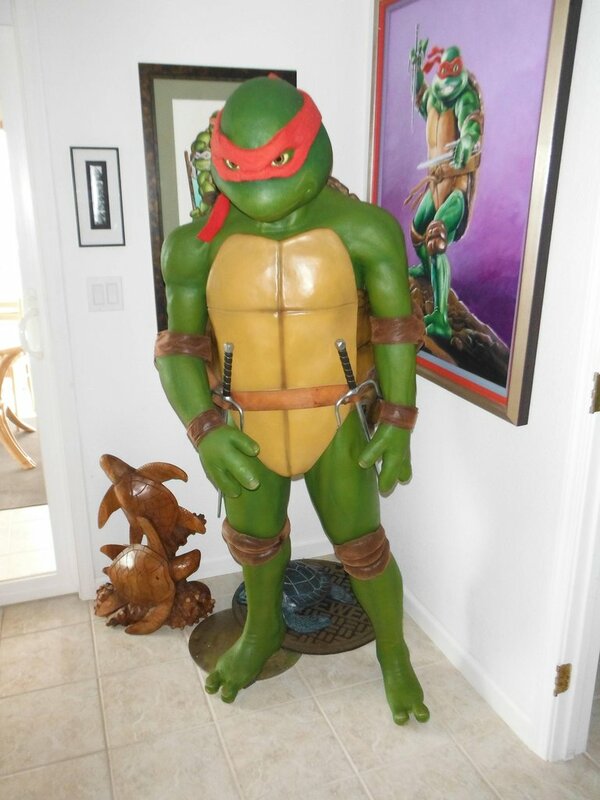 One such private collector acquired an animatronic Donatello that once hung in a karate-kicking action pose in a Planet Hollywood. When he realized how much money and work would be involved to make Donnie presentable again after years of being on display, he decided to try to quickly recoup his money instead by chopping up the purple-accessorizing Turtle and sell him piecemeal. The once proud ninja, who made countless children smile in theaters and on family trips, ended up in a pile of sawed off green body parts resembling a grisly homicide crime scene. His dismembered webbed toes fetched $600. The rest of him is scattered who knows where. I contacted the sequel’s prop master, Richard “Petie” Waldrop, who also worked in the prop department during the first film, to ask for his opinion on the weapons. He writes as if he’s typing out the e-mail in Morse code. That was all this mozzarella lover had to hear. I reached out to the Hawaiian homeowner who had acquired the abandoned Turtle treasure trove, and she shared with me more pictures of the prop master’s letter of authenticity that he made for the weapons and even the original packaging, postmarked 2000. I had contacted her just as she was in the middle of negotiations with a comic book store owner in Chicago. She wanted a cool $25,000 for the entire collection. Chicago Man was dragging his feet, though, and she had enough of his breezy Chi-Town attitude. 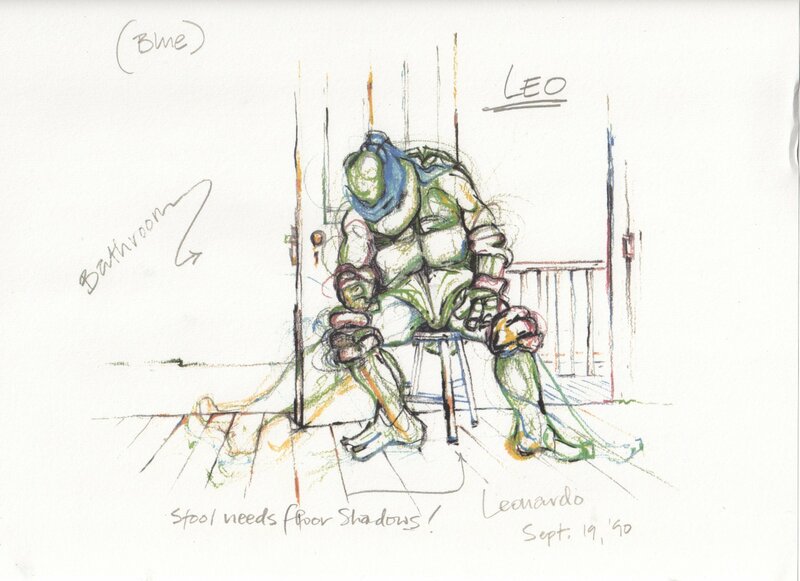 With “a little” nudging, I tried to convince her to ditch deep dish and break up the lot, which also included April O’Neil’s sketch of Leonardo that artist Karen Stewart drew for the emotional farm scene. 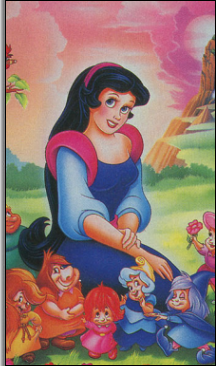 There were multiple versions of that iconic drawing used during filming, which resulted in continuity errors. The one that the Shredder takes from Danny, for example, shows a different image than the one April is seen doodling. 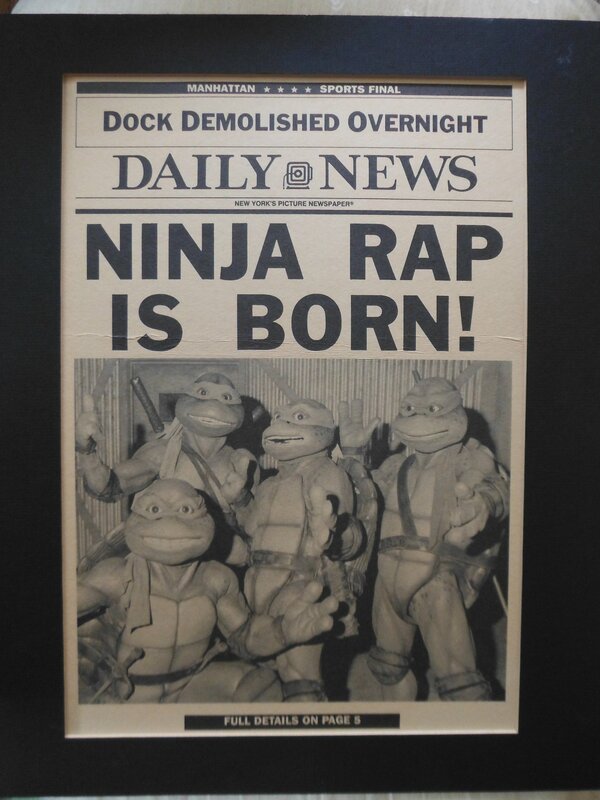 There was even a Vanilla Ice-inspired “Ninja Rap Is Born!” newspaper in the mix. There were three “stuffed versions” of the newspaper used on the set of Teenage Mutant Ninja Turtles II: The Secret of the Ooze. The pages inside of the stuffed versions, which were made at a real newspaper printing press, were actually from a widely used prop newspaper template that can be seen in many shows at the time like Full House and Saved by the Bell. This particular example is a little bit different, though. After filming wrapped, the prop master framed three production-made covers and gave them out to the crew as gifts. The film’s director, Michael Pressman, received one. This is likely one of the others that possibly came from a studio auction held in 2004. She would make more money, I argued, and more importantly make more fans happy that way. She was intrigued by the idea but insisted on selling the weapon movie props as a set for a five figure sum. Being a Mikey fan for life, the nunchakus would be enough to save my millennial soul. She suggested that I buy the entire set, keep the ‘chuks, and then sell the other weapons. Getting that kind of money together would be impossible without breaking a few laws. She agreed to accept a collective group deal if I could find three other people to chip in. That’s when the fun began. She gave my e-mail address to potential buyers, and before I knew it, I was swimming in messages from fellow nostalgic geeks, pop culture collectors, and entrepreneurial resellers around the globe. A longtime cinematographer friend wanted in, but money was short for him because he had just bought a screen-worn Foot Soldier mask for $2,700 and some other props from the Masters of the Universe movie starring Drago as He-Man. He headed off to quickly sell some things so that could afford the katana. 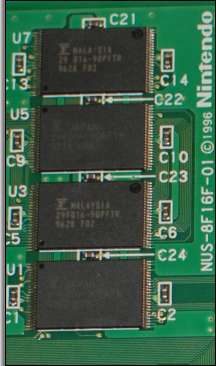 An active online Ninja Turtle community contributor from Australia stepped up soon after that to commit to Raphael’s sai. That only left the bo, which I was able to perfectly match to a publicity shot that was taken on the set of Teenage Mutant Ninja Turtles II: The Secret of the Ooze. The end was within sight. Less than a day later, however, the seller informed me that someone had just come forward to buy all of the weapons. That deep-pocketed person, an unknown man from Maryland, had been told about the group buy going on but he never spoke with me. That was because he wanted them all for himself, and he was prepared to send the funds plus shipping plus fees as soon as she supplied him with her PayPal address. In all likelihood, they’d never be seen again. As my tears began falling, and the world, as I knew it, faded away, I composed the most sadly beautiful e-mail in response, professing my undying love for Michaelangelo and my unshakable need for his wooden sticks and rope. Touched by my insanity, she gave me the weekend to locate someone willing to grab Donatello’s gigantic staff. That special fellow, a Donnie die-hard from Oregon, who is a regular member of a large prop making forum, came forward at 2:47 AM on Sunday. A hundred e-mails later, the deal was complete. Or so I thought. My pal who wanted Leonardo’s trusty swords backed out at the very last minute. It seems that no one gives a damn about the 1987 He-Man movie, so he couldn’t sell anything from it and came up short in the end. Fortunately, I had been putting money aside for an emergency. This was an emergency. A few days later, on my birthday, no less, the post office came bearing gifts: a Priority Mail box holding the nunchakus, a bunch of original continuity Polaroids from filming, and a couple of hand-typed letters from the prop master. 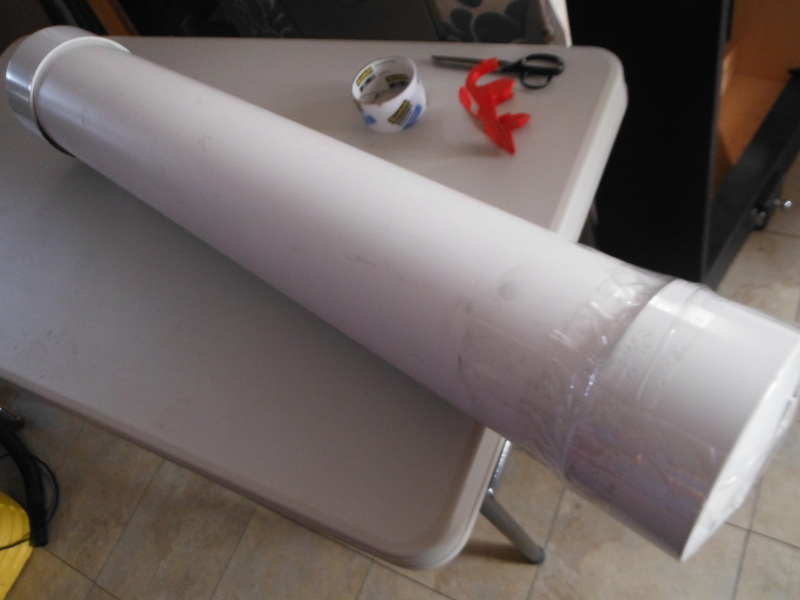 Even more magical than that was how the seller had decided to ship the katana: in an actual sewer pipe! It was new, of course, and unused, thank goodness, and the seller said that she did not at all make the connection at the time and was only looking for the safest way to ship the long weapons, but imagining Leonardo bubble wrapping his swords and then placing them carefully into a pipe taken from the sewer lair just put the goofiest grin on my face. After decades of aimlessness, my God hole had finally been filled with Hollywood martial arts weapons. 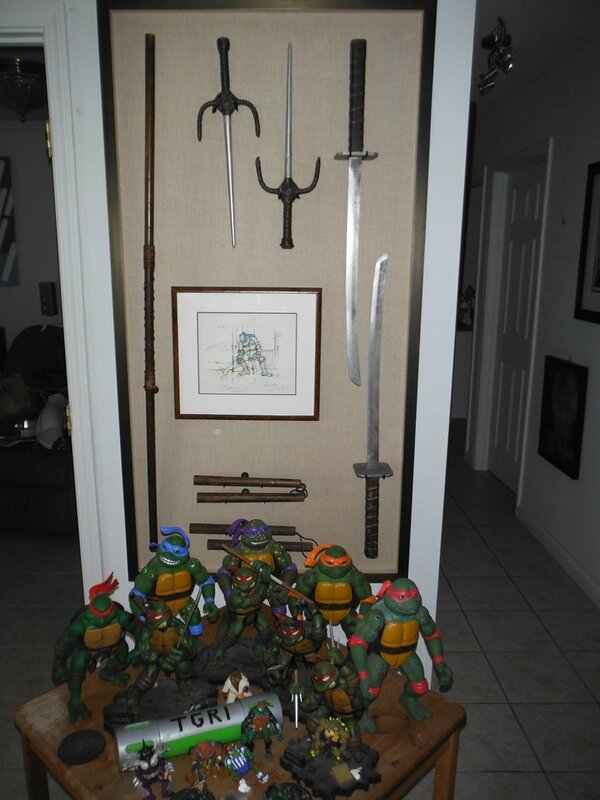 To be more precise, the hole had been filled with Wilmington, North Carolina martial arts weapons, as that was where almost all of the first two live-action Ninja Turtles movies were shot at Screen Gems Studios, the same location where the popular ’90s television show Dawson’s Creek was filmed. It is also where Brandon Lee, the aspiring actor son of Bruce Lee, was fatally struck on the set of The Crow as the result of an accidental gunshot. 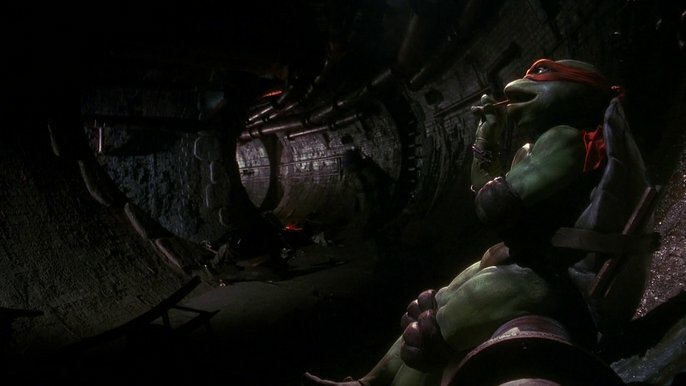 Almost as tragic was that many of the Turtle movie crewmembers worked together again in the nearby abandoned Ideal Cement Factory for 1993’s chaotic Super Mario Bros.
Who was the previous owner, this mystery man who had stranded such wonders in paradise? All I could manage to find out about him was that he willingly left everything behind, including a personal computer that is brimming with Ninja Turtle images, as part of the real estate deal, and that he’s a practicing psychologist with a PhD. I’d imagined the weapons would have made for some real “breakthrough” group therapy sessions. The nunchakus measure 12″ in length. They are made of solid wood, while the cords are leather. They are Mikey’s weapon of choice, aside from his pizza cutter. He can be seen carrying them throughout the original Teenage Mutant Ninja Turtles. 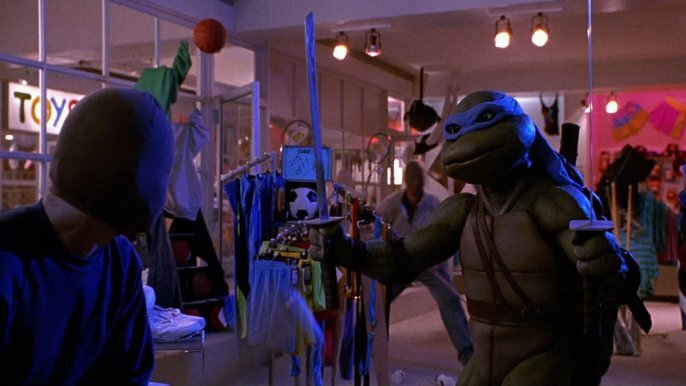 They may have also been used in the sequel, although the party-loving Turtle didn’t twirl them around as much because of the complaints received from parent groups upset with the level of violence in the first film. 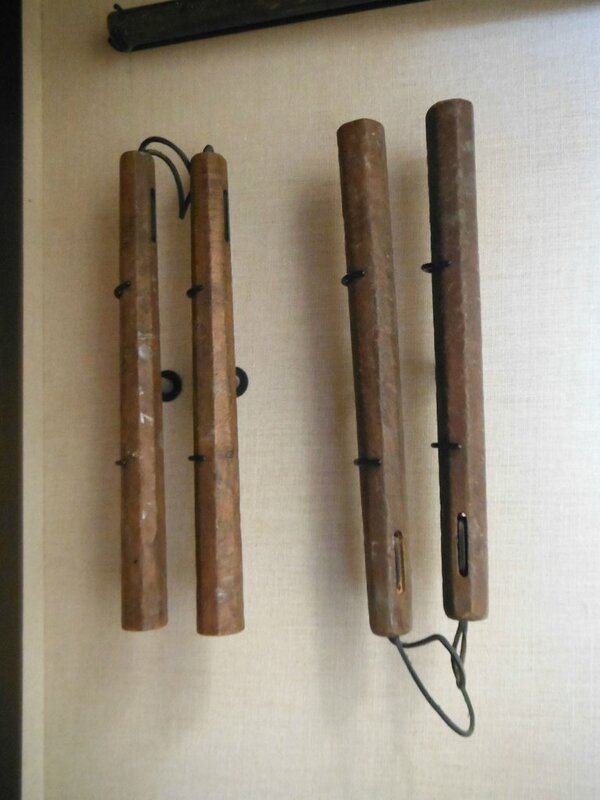 These nunchakus show an incredible amount of wear, including several scars on the wood and scattered splotches of white paint, evidence that they had quite the workout. 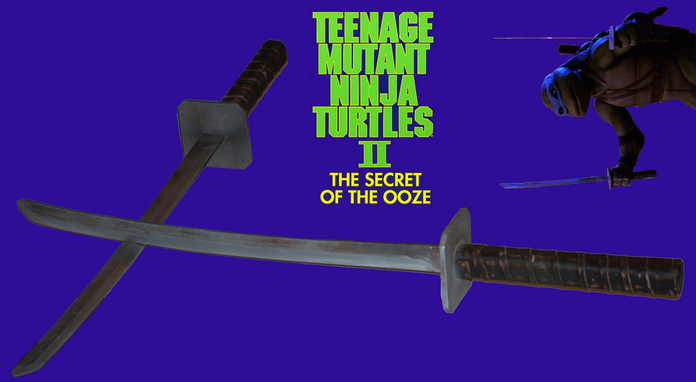 The pair of katana is similar to the ones seen during the opening of Teenage Mutant Ninja Turtles II: The Secret of the Ooze when Leo brandishes them at the robbers in the mall. 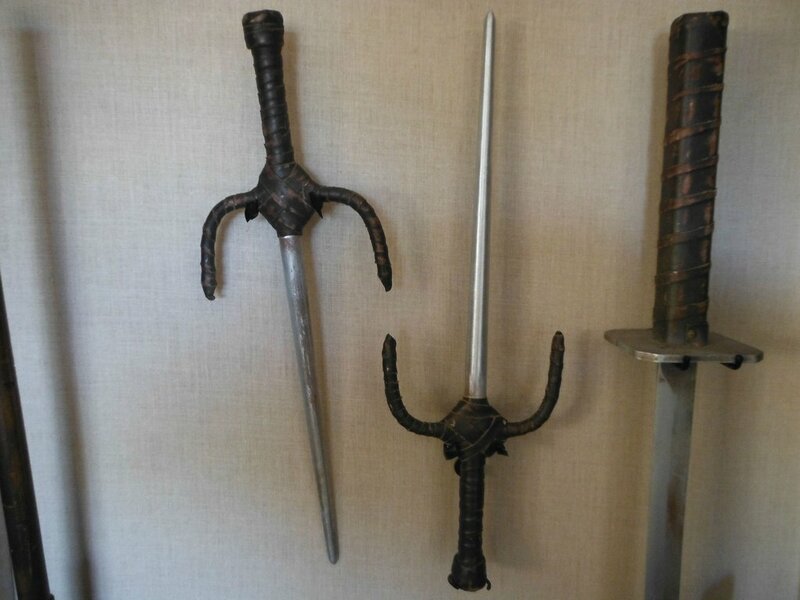 Each sword measures 33″ in length. The blades and hand guards are made of a heavily built aluminum, while the hilts are wooden and wrapped in leather. The blade edges are not serrated but are substantial enough in weight to still cause injury. In an interview with Variety, Judith Hoag, who played April in the first movie when she was only 22, said that she had witnessed several injuries on the set. “They had all these stunt people who came in from Hong Kong, who had no union protections. They were getting hurt,” Hoag recalled. “As soon as they were injured, they were shipped out of there. It was not the safest set to be on. That’s a little distressing. People are doing the movie, doing the best they can on the budget and I think producers lose sight sometimes there are actual human beings involved” (link). I had finally achieved total Turtle Power. 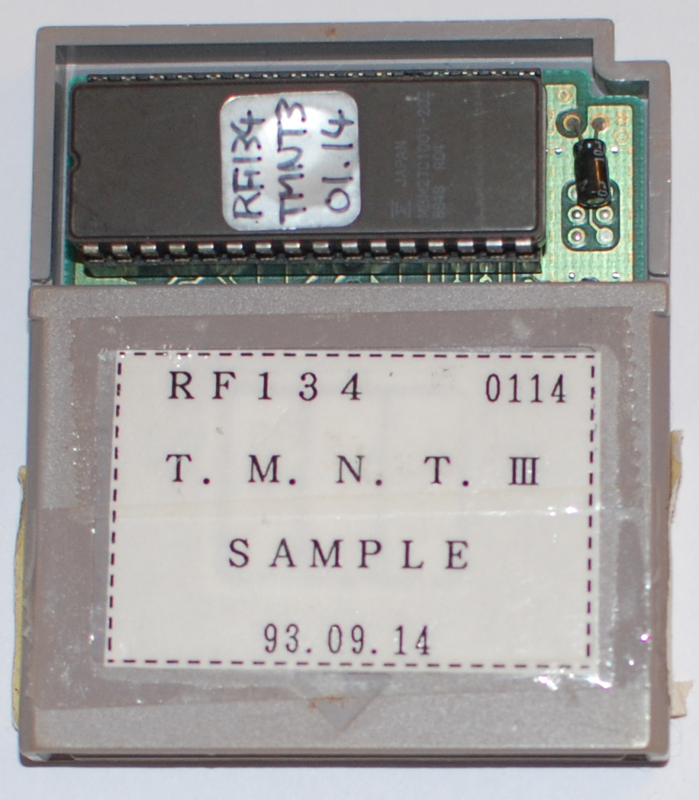 Now it was time for a rescue of another kind, to clean out former Tips & Tricks magazine Senior Editor Jason Wilson of one of his last Ninja Turtle pre-release cartridges, Teenage Mutant Ninja Turtles III: Radical Rescue for the Game Boy. 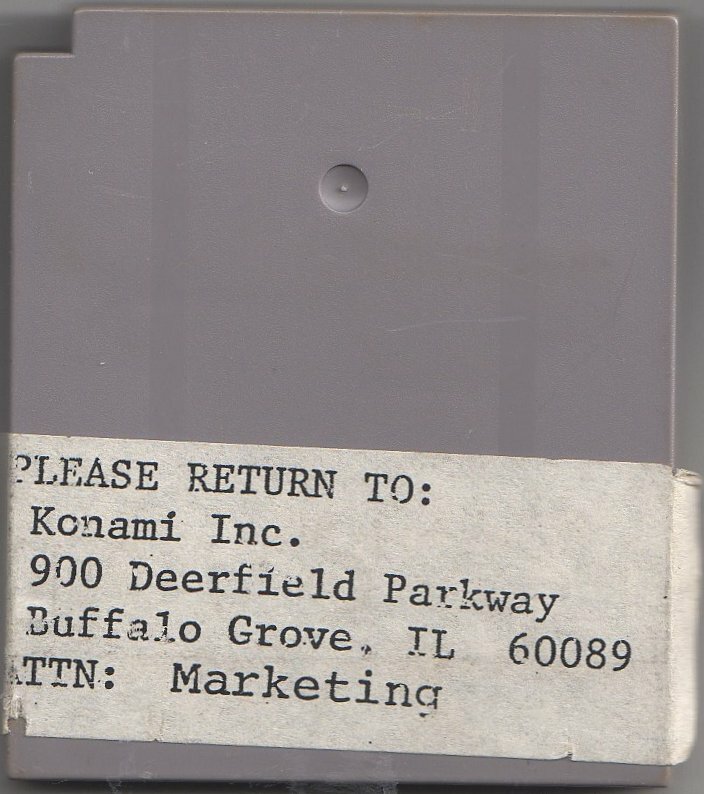 There’s another label on the back of the cartridge with Konami of America’s old Buffalo Grove, Illinois address. It is specifically addressed to the marketing department, signifying that this game was most likely sent to the press. 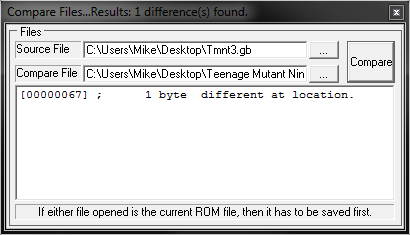 After backing up its data, I discovered that only one byte is different. I gave these mutants the best years of my life. You know what, at least I have the most amazing nunchuks to hit myself with to help me get over the shellshock.